For womens suffering from Alopecia, wigs are often an option they look to for regaining some of their confidence (and sexuality). Whether you are an experienced wig-buyer, or you are looking at your first wig purchase, the process can certainly be frustrating and confusing. That's why we started this on-going series where we talk to wig manufacturers and ask the questions you've been dying to know. We recently were able to talk again to Fortune Wigs, a family-owned and operated company that specializes in human hair wigs for women. Last time we talked to them, the conversation focused on how human hair wigs are made. Today, our discussion focuses more on the wig prices, quality and the wig industry as a whole. We truly appreciate Kenneth Deutsch for his candid and illuminating answers to our questions. Q. 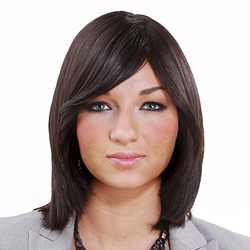 What are the most critical factors that determine the consumer price for human hair wigs today? The “grade" of the hair being used. The process used to create the unit. Hair varies a lot in price from the very processed hair on the lower end to virgin hair on the higher end of the spectrum. Whether or not the unit is hand-sewn affects the price. Hand-sewing is very labor intensive and the most expensive type of hand-sewing is the “French-Top” process that creates the illusion of a false scalp by pulling each individual hair through a material “scalp” before sewing and knotting the hair into an invisible layer beneath. However, there is also a third factor that is often not taken into consideration. Regardless of the brand and the level of quality being used, there may be an issue with your unit. You may get stuck with a lemon, or there may be an issue relating to human error. It happens from time-to-time. Purchasing from a company that won’t give you the run-around and will take responsibility and fix or replace a faulty unit buys you peace of mind. Ideally, the customer can take comfort in knowing that should a problem arise it will be taken care of. That expense should be borne by your supplier and that assurance is worth paying a premium for. Q. What are the top 5 misconceptions that customers have about the wig manufacturing industry? Believing that $700 for a high quality human hair wig with a warranty is expensive. In today's market, it isn't. Wig making is a precise process. To some degree every unit is unique. European hair comes from Europe. Not necessarily. European hair is a reference to the ethnic origin of the hair, not its geographical source. Colors are consistent from one brand to the next. The opposite is true. Color numbers can mean very different things to different brands. Ordering a customized unit is automatically more expensive. It depends on the customizations being requested. We do not add a surcharge for custom measurements and other smaller customizations. Labor intensive add-ons like a fully hand-tied unit will increase the cost. Q. Do you foresee any changes in the technology used to repair a wig? Is the turnaround time getting faster because of methods and materials? A. The process for making and repairing wigs has remained remarkably consistent for many years. Nothing can replace an expert seamstress resizing a wig or hand-sewing a wig…yet. We do many repairs and adjustments in-house and the turn-around time for that is usually just a few days. One thing I would like to see is a machine that will replace the tedious 50 hours (or so) that go into hand-sewing a wig. Such an invention would cut the special order/custom order process in half (presently about 6 weeks). Q. What are the wig industry’s trends going forward? A. Customers demand quality (as they should). I do not see a clear trend in terms of style. Women and girls want to be “in style” and that fluctuates within wider style trends and even within her region. As customers become more educated and experienced, the potential for buying your hair as the ultimate solution to hair loss becomes a tangible reality. The more the customers are educated, the more the customers tend to request customizations and learn how to make the hair work for them. For example, more experienced customers will order the unit “raw” (our term for “not cut or styled”) so they can have it cut on their heads by their own stylists. Clients also learn how to request higher and lower densities so they can achieve a look that they feel is true to themselves. Q. Do you believe the wig industry and consumers would benefit from a truth in labeling law such as consumers have for apparel and bedding? A. A law without a mechanism to enforce it would be useless. Unfortunately, I’m not sure enforcement is possible or financially viable. For example, verifying the ethnicity of the hair in a unit can be done with DNA testing. However, doing so would significantly increase production costs. If it can be done in a responsible way that won’t increase costs too much, we would be supportive. Increased transparency would improve customer confidence in general. It would also level the playing field so honest companies don’t have to compete with those who are not quite as straightforward. As always, we truly appreciate Fortune Wigs answering our questions so honestly. It's wonderful to shine some light on a subject that often feels a bit dark and unknown.